The Formulate® Essential Tabletop Horizontal Curve Display has a customary frame and is portable. The economy aluminum tube frame features bungee cords, rounded corners and comes with a one year limited warranty. Simply pull the pillowcase fabric graphic over the frame and zip. 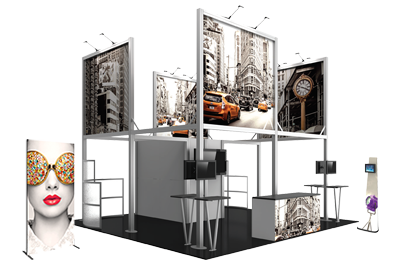 All displays have an overall height of 5ft and fit on a 8ft wide table and come with a canvas carry bag.